Salt to be sold by weight. AN ingrossed Bill, from the Lords, intituled, An Act for enabling Simon Lord Bishop of Ely, and his Successors, to lease the Manor-house and Demesne-lands in Downham, in the Isle of Ely; and for confirming a Lease lately thereof made by the said Bishop; and for the clearing of the said Bishop, and others, from Dilapidations there; was read the First time. A Petition of the Tanners, Glovers, Skinners, and other Artificers of the Leather-Trade, within the Borough of Warwick in the County of Warwick, was presented to the House, and read: setting forth, That they find, by woful Experience, that the late Duty upon Leather will ruin the Petitioners Trades and Families; for that they are forced, through the Scarcity of Money, to sell their Commodities 12 d. in the Pound cheaper than before the Duty; And praying, That the said Duty may be taken off. Ordered, That the Consideration of the said Petition be referred to the Committee, to whom the Petition of the Aldermen, Stewards, and Company of Fellmongers, Leather-dressers, and Glovers, in the City of Chester, is referred; And that they do examine the Matter; and report the same, with their Opinion therein, to the House. A Petition of the Cordwainers, or Shoemakers, within the Town of Beverly, in the County of York, was presented to the House, and read; setting forth, That out of their great Duty to his Majesty, they have endeavoured to pay the late heavy Duty of 15 l. per Cent. upon Leather; though with great Hardship, by reason great Quantities of Leather are daily transported; and for that the Collectors put Hardships in collecting the said Duty, not intended as the Petitioners conceive: And praying the Relief of the House in the Premises. Ordered, That the Consideration of the said Petition be referred to the Committee, to whom the Petition of the Aldermen, Stewards, and Company of Fellmongers, Leather-dressers, and Glovers, in the City of Chester, . . . . . . .: And that they do examine the Matter thereof; and report the same, with their Opinion therein, to the House. A Petition of the Company of Tanners in the ancient Boroughs of Bewdly and Kidderminster, in the County of Worcester, and Places adjacent, was presented to the House, and read; setting forth, That, by reason of the late Duty laid upon Leather, that Trade is much lessened; and if the said Duty be continued, it will endanger the Loss of the Tanning Trade here; several Tanners being already gone, and others intending to go, into Ireland, where is no Imposition upon Leather: And praying the Consideration of the House, and Relief in the Premises. Ordered, That the Consideration of the said Petition be referred to the Committee, to whom the Petition of the Aldermen, Stewards, and Company of Fellmongers, Leather-dressers, and Glovers, in the City of Chester, is referred: And that they do examine the Matter thereof; and report the same, with their Opinion therein, to the House. A Petition of the Tanners and Curriers in and near the City of Worcester was presented to the House, and read; setting forth, That the Petitioners labour under great Difficulties, by reason of the Duty upon Tanned Leather, so that their Trades, at present, seem to be at a full Stop; for that they usually sell their Goods upon Trust, and must pay the King's Duty in ready Money; which very much lessens their small Stocks: And praying, That the said Duty may be taken off. Mr. Monckton, according to Order, presented to the House, a Bill to prevent the Corrupting of Juries: And the same was received. Resolved, That the Bill be read a Second time upon this Day Sevennight, in a full House, at Twelve a Clock. Mr. Clark reported from the Committee, appointed to draw up Reasons to be offered at a Conference with the Lords, for disagreeing to the Amendment made by the Lords to the Bill, intituled, An Act for continuing the Imprisonment of * * Counter, and others, for the late horrid Conspiracy to assassinate the Person of his Sacred Majesty, . . . . . had drawn up the same accordingly; and had directed him to report the same to the House; which he read in his Place; and afterwards delivered in at the Clerk's Table: Where the same were twice read, and agreed unto by the House; and are as follow; viz. The Commons cannot agree to the Amendment, made by the Lords, to the said Bill, by adding Clause A at the End thereof. 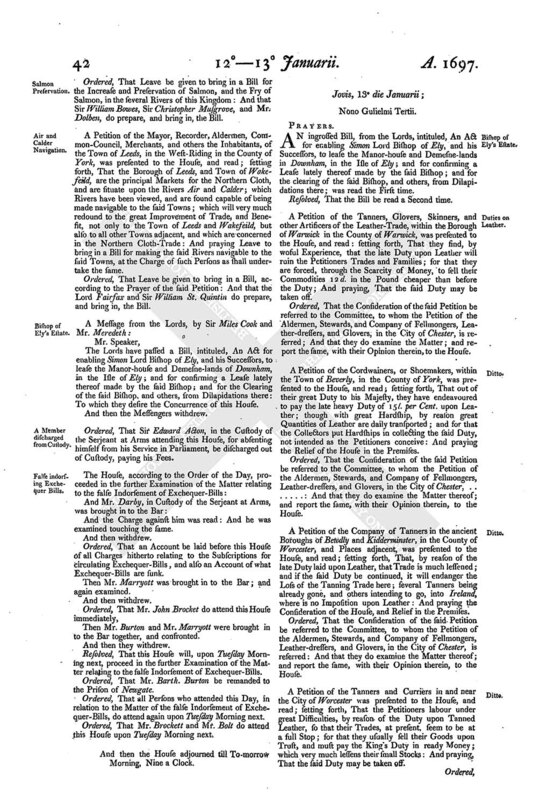 1st, Because it is introductive of a new general Law; whereas the Bill concerns particular Persons, who are notoriously criminal in having been engaged in a barbarous and traitorous Conspiracy to assassinate his Majesty's Person; which has already been legally proved against several of their Fellow-Conspirators, who have been attainted, and executed; and, at their Execution, consest the said Conspiracy. 2dly, Because the Clause is not only general, but uncertain, and capable of various Interpretations: And the Commons do not well know what is meant by the Protection of both Houses of Parliament; the Persons intended to have the Benefit thereof having the Protection of the King, and the Laws, cannot, as the Commons conceive, need any other. Resolved, That a Conference be desired with the Lords upon the Subject-matter of the said Amendment. Ordered, That Mr. Clark do go to the Lords, and desire the said Conference. The Lords have passed a Bill, intituled, An Act to enable Rebecca Lascells, Widow, to sell Copyhold Lands and Houses in Ealing in the County of Middlesex: To which they desire the Concurrence of this House. And then the Messengers withdrew. Mr. Clark reported, That he having, according to Order, been at the Lords to desire a Conference upon the Subject-matter of their Amendment made to the Bill, intituled, An Act for continuing the Imprisonment of * * Counter, and others, for the late horrid Conspiracy to assassinate the Person of his Sacred Majesty, the Lords do agree to a Conference immediately, in the Painted Chamber. Ordered, That the Committee who drew up the said Reasons do manage the Conference. And the Managers went to the Conference. 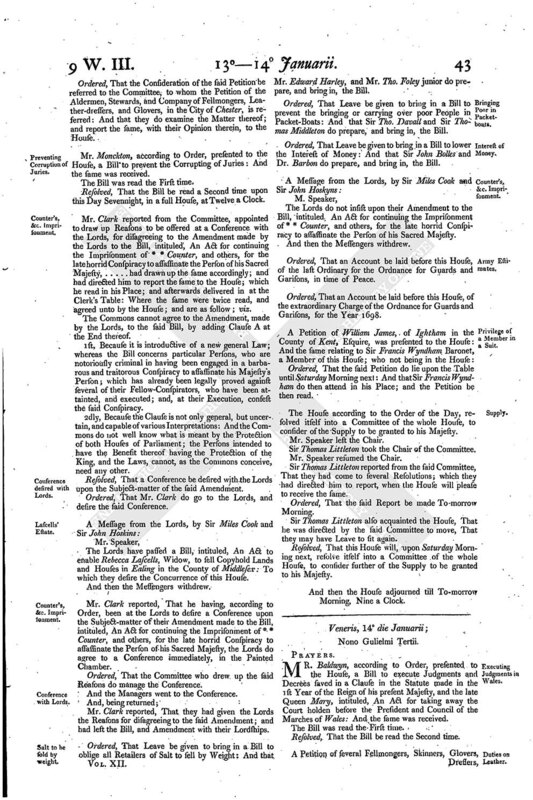 Mr. Clark reported, That they had given the Lords the Reasons for disagreeing to the said Amendment; and had left the Bill, and Amendment with their Lordships. Ordered, That Leave be given to bring in a Bill to oblige all Retailers of Salt to sell by Weight: And that Mr. Edward Harley, and Mr. Tho. Foley junior do prepare, and bring in, the Bill. Ordered, That Leave be given to bring in a Bill to prevent the bringing or carrying over poor People in Packet-Boats: And that Sir Tho. Davall and Sir Thomas Middleton do prepare, and bring in, the Bill. Ordered, That Leave be given to bring in a Bill to lower the Interest of Money: And that Sir John Bolles and Dr. Barbon do prepare, and bring in, the Bill. The Lords do not insist upon their Amendment to the Bill, intituled. An Act for continuing the Imprisonment of * * Counter, and others, for the late horrid Conspiracy to assassinate the Person of his Sacred Majesty. Ordered, That an Account be laid before this House, of the last Ordinary for the Ordnance for Guards and Garisons, in time of Peace. Ordered, That an Account be laid before this House, of the extraordinary Charge of the Ordnance for Guards and Garisons, for the Year 1698. Ordered, That the said Petition do lie upon the Table until Saturday Morning next: And that Sir Francis Wyndham do then attend in his Place; and the Petition be then read. The House according to the Order of the Day, resolved itself into a Committee of the whole House, to consider of the Supply to be granted to his Majesty. Sir Thomas Littleton took the Chair of the Committee. Sir Thomas Littleton reported from the said Committee, That they had come to several Resolutions; which they had directed him to report, when the House will please to receive the same. Ordered, That the said Report be made To-morrow Morning. Sir Thomas Littleton also acquainted the House, That he was directed by the said Committee to move, That they may have Leave to sit again. Resolved, That this House will, upon Saturday Morning next, resolve itself into a Committee of the whole House, to consider further of the Supply to be granted to his Majesty. And then the House adjourned till To-morrow Morning, Nine a Clock.